Is it possible to become addicted to buying fabric?? I keep seeing gorgeous fabrics and think "Oooh, that would look great on a mannequin!" and then just have to buy some. 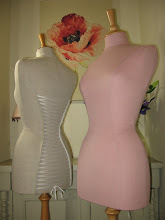 I have an ever growing stock of fabrics and am slowly working through them to add new mannequins to the site. I discovered Alexander Henry fabrics a few months ago now and just love his bold designs! This one is called 'Inked' and I think the scale of the design is just right on the mannequin - I'm really pleased with how she worked out. 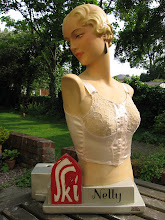 If anyone knows of any more retro styled fabrics that they think would look great on a mannequin, then I would love to hear your suggestions! Don't forget, that if you 'like' my facebook page you will be entered into a free giveaway draw. Full details to be announced tomorrow. Very cool! I love your mannequins! I cannot wait to purchase one. I live in the US.